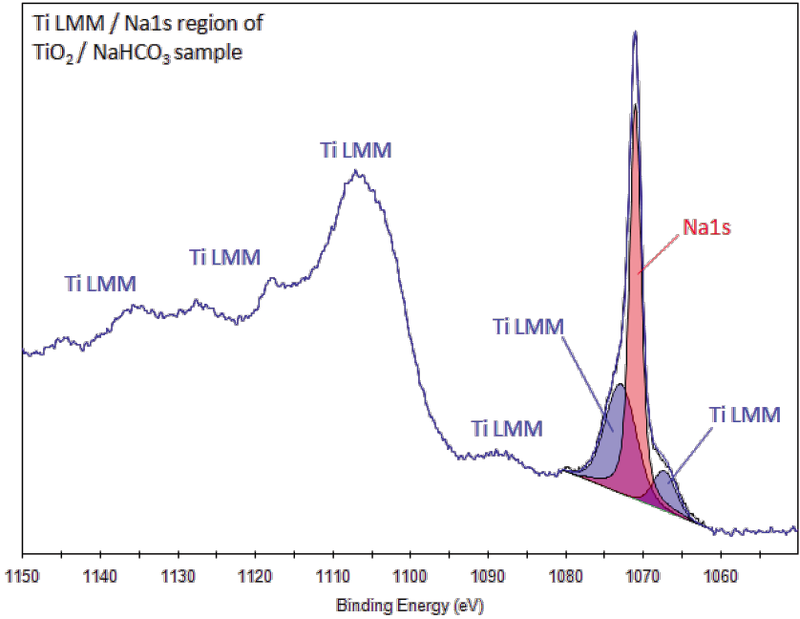 In the presence of a high concentration of titanium, acquire Na2s or Na KLL peak as well as (or instead of) Na1s peak. There are only a small range of chemical shifts ~0.5eV and determination of chemical state may require use of corresponding regions to infer chemical state. Na1s peak accompanied by strong Auger peak at ~497eV. 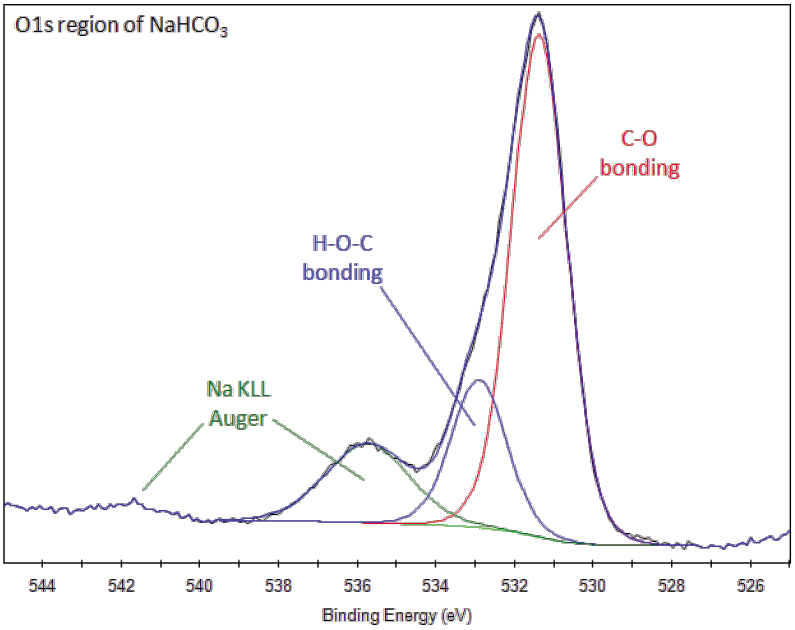 If sodium is buried (under carbon, for example), Na Auger peak may be observed even if Na1s is not (due to difference in electron kinetic energy). Similarly, Na2s (high kinetic energy) may be observed even if Na1s is not. Potential sodium Auger overlap with O1s (typically ~536eV). The Na1s peak is strongly overlapped by Ti LMM Auger peaks. This overlap is particularly important, for example, when analyzing apatite formation on the bioactive alloy, Ti-6Al-4V. To quantify the Na1s peak in these situations, it is necessary to peak fit the overlapping XPS and Auger peaks. Na is a highly reactive metal and usually only sodium compounds will be observed in XPS spectra. The presence of sodium, especially with the presence of chlorine and an intense hydrocarbon C1s peak can indicate contamination from manual handling, without use of gloves. Glass materials may exhibit increased amount of sodium at the surface due to diffusion processes. Exposure of glass to higher energy electrons (few hundred eV or higher) may cause diffusion of Na into bulk or across the surface out of the irradiated area. This soft, waxy, silvery, reactive metal was isolated in 1807 by Sir Humphry Davy, though it had been recognized in compounds long before. A compound of sodium was used as a headache remedy in Medieval Europe. The most common compound of sodium is sodium chloride, or table salt. Another compound is used in soap in combination with fatty acids. Sodium is the most abundant of all alkali metals, and the fourth most abundant element overall, making up 2.6% of the Earth’s crust. It is also relatively abundant in stars. Sodium, being highly reactive, burns with a yellow flame, oxidizes in air, and will spontaneously ignite in water. 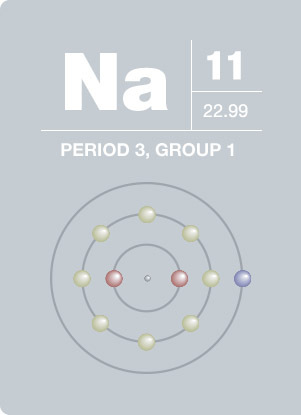 Sodium ions are necessary in the depolarization of cells, vital to the neural system of most animals, including humans.